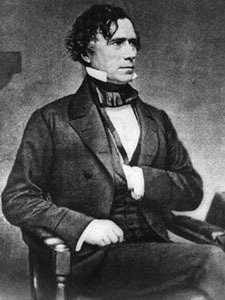 Executive summary: 14th President of the U.S.
Franklin Pierce, the fourteenth president of the United States, was born at Hillsborough, New Hampshire, on the 23rd of November 1804. His father, Benjamin Pierce (1757-1839), served in the American army throughout the War of Independence, was a Democratic member of the New Hampshire House of Representatives from 1789 to 1803, and was governor of the state in 1827-29. The son graduated in 1824 at Bowdoin College, at Brunswick, Maine, where he formed a friendship with Nathaniel Hawthorne. Pierce then studied law, and in 1827 was admitted to the bar and began to practise at Hillsborough. He at once took a lively interest in politics, and from 1829 to 1833 served in the state House of Representatives, for the last two years as Speaker. In 1833 he entered the national House of Representatives, and although he achieved no distinction in debate he was a hard worker, and a loyal supporter of the policies of President Andrew Jackson. After four years in the House he entered the Senate, being its youngest member. In 1842, before the expiration of his term, he resigned his seat, and at Concord, New Hampshire, began his career at the bar in earnest, though still retaining an interest in politics. In 1845 he declined the Democratic nomination for governor, and also an appointment to the seat in the United States Senate made vacant by the resignation of Judge Levi Woodbury. He accepted, however, an appointment as Federal District Attorney for New Hampshire, as the duties of this office, which he held in 1845-47, were closely related to those of his profession. In 1846 he again declined public honors, when President James Knox Polk invited him to enter the cabinet as attorney-general. Soon after the outbreak of the war with Mexico, in 1846, Pierce enlisted as a private at Concord, but soon (in February 1847) became colonel of the Ninth Regiment (which joined General Winfield Scott at Pueblo on the 6th of August 1847), and later (March, 1847) became a brigadier-general of volunteers. At the battle of Contreras, on the 19th of August 1847, he was thrown from his horse and received severe injuries. At the end of the war he resigned his commission and returned to Concord. In 1850 Pierce became president of a convention assembled at Concord to revise the constitution of his state, and used his influence to secure the removal of those provisions of the constitution of 1792 which declared that only Protestants should be eligible for higher state offices. This amendment passed the convention in April 1852, but was rejected by the electorate of the state; a similar amendment was adopted by popular vote in 1877. In January 1852 the legislature of New Hampshire proposed him as a candidate for the presidency, and when the Democratic national convention met at Baltimore in the following June the Virginia delegation brought forward his name on the thirty-fifth ballot. Although both parties had declared the Compromise of 1850 a finality, the Democrats alone were thoroughly united in support of this declaration, and therefore seemed to offer the greater prospect of peace. This fact, combined with the colorless record of their candidate, enabled them to sweep the country at the November election. Pierce received 254 electoral votes, and General Winfield Scott, his Whig opponent, only 42. The Democrats carried every state except Massachusetts, Vermont, Kentucky and Tennessee. No president since James Monroe had received such a vote. Pierce was the youngest man who had as yet been elevated to the presidency. For his cabinet he chose William L. Marcy of New York, Secretary of State; Jefferson Davis of Mississippi, Secretary of War; James Guthrie (1792-69) of Kentucky, Secretary of the Treasury; James C. Dobbin (1814-57) of North Carolina, Secretary of the Navy; Robert McClelland (1807-80) of Michigan, Secretary of the Interior; James Campbell (1813-93) of Pennsylvania, Postmaster General; and Caleb Cushing of Massachusetts, Attorney General. This was an able body of men, and is the only cabinet in American history that has continued unbroken throughout an entire administration. Although Pierce during his term in the Senate had severely criticized the Whigs for their removals of Democrats from office, he himself now adopted the policy of replacing Whigs by Democrats, and the country acquiesced. Pierce had no scruples against slavery, and opposed anti-slavery agitation as tending to disrupt the Union. The conduct of foreign relations was on the whole the most creditable part of his administration. The Koszta Affair (1853) gave the government an opportunity vigorously to assert the protection it would afford those in the process of becoming its naturalized citizens. When the British government refused to prevent recruiting for the Crimean War by their representatives in America, their minister, John F. Crampton, received his passports, and the exequaturs of the British consuls at New York, Philadelphia and Cincinnati were revoked. A commercial treaty was negotiated with Japan in 1854 after Commodore Matthew Perry's expedition in the previous year. As an avowed expansionist, Pierce sympathized with the filibuster government set up in Nicaragua by William Walker, and finally accorded it recognition. It was during this term also that the Gadsden Purchase was consummated, by which 45,535 square miles of territory were acquired from Mexico, and that three routes were surveyed for railways from the Mississippi river to the Pacific coast. When the Democratic national convention met at Cincinnati in June 1856, Pierce was an avowed candidate for renomination, but as his attitude on the slavery question, and especially his subserviency to the South in supporting the pro-slavery party in the Territory of Kansas, had lost him the support of the Northern wing of his party, the nomination went to James Buchanan. After retiring from the presidency Pierce returned to Concord, and soon afterwards went abroad for a three years' tour in Europe. Many Southern leaders desired his renomination by the Democratic party in 1860, but he received such suggestions with disfavor. After his return to America he remained in retirement at Concord until the day of his death, the 8th of October 1869. Pierce was not a great statesman, and his fame has been overshadowed by that of Thomas Hart Benton, John C. Calhoun, Henry Clay and Daniel Webster. But he was an able lawyer, an orator of no mean reputation, and a brave soldier. He was a man of fine appearance and courtly manners, and he possessed personal magnetism and the ability to make friends, two qualities that contributed in great measure to his success.